Much like in any lasting real life relationship, good chemistry is an essential component of any successful romantic comedy couple. In fact, really good chemistry can even make up for other potential cinematic shortcomings. And such is the case in Ben Palmer's 'Man Up,' an enjoyable yet familiar date flick that manages to charm its way out of mediocrity largely based on the interplay between its co-stars. Though perhaps a bit too traditional in its adherence to narrative formula, the film's entertaining cast and earnest scripting ultimately bring an effectively passionate and amusingly quirky spark to a few otherwise well-worn tropes. Nancy (Lake Bell) is a single 34-year-old woman who has seemingly given up on the prospect of love. Meanwhile, Jack (Simon Pegg) is a 40-year old divorcee waiting to meet his blind date. When Nancy is mistaken for Jack's date, the romantically unlucky woman decides to avoid correcting him. As the pair enjoy a few drinks, sparks seemingly start to fly, but the couple's future is put into jeopardy when Nancy's lie threatens to be revealed. In the film's opening scene, the camera embarks on an extended shot that follows an anonymous couple playfully retreating from a party toward their hotel room. Clearly a bit tipsy and barely able to keep their hands off each other, the physical chemistry between the nameless pair is palpable. Once they reach their bed, we quickly transition to Nancy -- holed up alone in her own hotel room struggling to psych herself up to go out. Through this simple juxtaposition, the filmmakers immediately and economically set up one of the script's central contrasts. For some people, romance (or dating or just hooking up) is easy, and for others… well, not so much. It's this frustrating dilemma that helps us to initially sympathize with Nancy and accept her otherwise hard-to-swallow decision to pretend to be someone else. While not especially clever, this central premise leads to a few worthwhile bits of comedy and drama, adding some welcome personality to standard rom-com conventions. With that said, the script offers no real attempts at genre subversion, and instead unashamedly adheres to typical date movie beats with a predictable yet endearingly earnest sensibility. Dialogue driven insights and musings on relationship theories are mixed in with a plethora of entertainingly cringe-worthy interactions, including but not limited to: awkward conversations, awkward silences, awkward ranting, awkward flirting, awkward arguing, awkward drinking, and awkward dancing. As a fan of uncomfortable, embarrassing comedy, most of these bits work well enough, though few of the jokes are particularly inspired. A comparatively broad sense of humor is also mixed in for good measure, and some of these choices are less successful than others (like an impromptu choreographed dance number). With that said, one of the film's biggest comedic gambles -- a potentially out-of-place character obsessed with Nancy played by Rory Kinnear -- ends up stealing every scene he's in. At first I was afraid that he might clash tonally with the film's relatively naturalistic style, but Kinnear manages to play up his character's quirks without completely leaving the movie's reality behind. 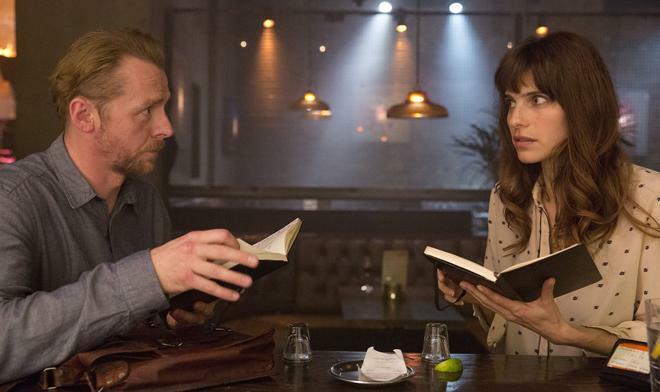 Amusing diversions aside, however, it's really Lake Bell and Simon Pegg who ultimately keep the film afloat. Together, the pair produce a playful sense of chemistry that is infectious, and they inject an extra level of personality into their characters that helps the flick sell some otherwise familiar romantic setbacks and dramatic reversals (the climax is a bit over-the-top). 'Man Up' doesn't really offer anything new when it comes to the standard romantic comedy formula, but the execution is amusingly heartfelt. While the scripting can be disappointingly formulaic (especially in the third act) and a tad broad, most of the comedy ends up working and the film's stars are fun to watch -- whether flirting, arguing, or flirting while arguing. 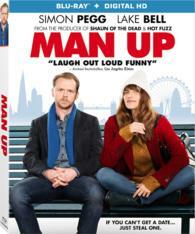 Lionsgate brings 'Man Up' to Blu-ray on a single BD-50 disc that comes housed inside a standard keepcase with a cardboard slipcover. After some skippable trailers, the disc transitions to a traditional menu screen. The packaging indicates that the release is region A coded. The movie is provided with a 1080p/AVC MPEG-4 transfer in the 2.40:1 aspect ratio. Nicely detailed and free from any notable technical issues, this is a rather lovely image. The digital source is in perfect shape with no signs of pesky artifacts or compression. Overall clarity is good, but the film appears to have an intentionally diffuse style, giving the picture a gentle glow that limits fine detail just a tad. Colors are nicely saturated with pleasing splashes of bold primaries. Contrast is also fairly well balanced with deep blacks and bright whites -- though the aforementioned diffuse style can lead to a faintly bloomy quality. While a little on the soft side, with its subtle stylization and clean picture, 'Man Up' comes to Blu-ray with a strong transfer. The film is presented with an English DTS-HD MA 5.1 track along with English SDH, English, and Spanish subtitles. Modest yet effective, the audio gets the job done with some occasional splashes of personality. This is a dialogue driven romantic comedy, and thankfully speech comes through clearly and well prioritized. While not particularly layered, the soundstage offers appropriate ambiance for all of the film's different locations, helping to bring various parties, bars, bowling alleys, and city streets to life with solid surround use. Directional effects are also used when called for, including a passing train that transitions to the rears. Bass activity is surprisingly punchy, with some deep LFE in specific music choices and deliberately boomy bass in loud bars. Dynamic range is distortion free, and the track revs up during a few key moments, including a mad-dash car ride. With that said, the mix does lack a certain level of texture, leaving some atmospherics (like city noise) feeling a bit sparse. Simple but not without some occasional kick, the audio suits the script's sensibilities well, placing emphasis on dialogue and unashamedly heart-tugging music selections. Lionsgate has put together a decent selection of supplements, including a making of doc, interviews, and gag reel. All of the special features are presented in 1080p with Dolby Digital 2.0 audio. Gag Reel (HD, 6 min) – This is a fairly amusing reel of flubs and alternate takes, including a lot of fun material from Rory Kinnear. Simon and Lake Interview Clips (HD, 4 min) – Here we get a sit down interview with the film's stars. The pair show off their fun chemistry as they joke their way through questions about bad dates, working together, and favorite romance movies. The Seven Beats of Man Up (HD, 41 min) – This is a comprehensive behind-the-scenes doc with cast and crew interviews and on-set footage. The participants discuss how they got involved with project, casting, characters, what it was like working together, the script's treatment of rom-com conventions, and how Lake Bell perfected her English accent. 'Man Up' is a pretty standard but ultimately worthwhile romantic comedy that mostly succeeds thanks to the fun on-screen chemistry between its leads. The video and audio are both good, offering a modest yet pleasing technical presentation. Though supplements are a little light, the included interviews, gag reel, and behind-the-scenes doc offer an appropriately playful look at the production. Predictable but entertaining, this is an enjoyable date flick. Worth a look.